Human embryonic stem cells have been grown in the UK for the first time, a team at King's College London announced on Wednesday. Its success is the first since such experiments were approved in Britain. The researchers say they will use the cells to research treatments for Parkinson's disease and Type 1 diabetes. But anti-abortion organisations described the research as unethical and unnecessary. The King's cell line was grown from an embryo originally created as part of a course of in-vitro fertilisation (IVF) treatment. 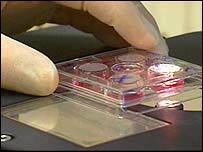 Under UK legislation, embryos created for IVF and not used after five years must be destroyed. The embryo used at King's was one such embryo and was donated to the researchers by its biological parents, who have finished their IVF treatment. At the time the cells were taken from the embryo it was a small clump of cells a few days old, visible only under a microscope. Scientists are interested in stem cells because they have the potential to become virtually any other kind of cell in the body and so might be used to replace tissues that have failed. 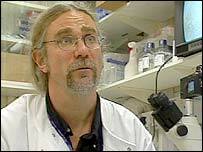 Professor Peter Braude, who led the research team, told the BBC that the breakthrough of a "bank" of stem cells would greatly help research in the UK. Stem cells needed to be grown and verified to find out their real potential and this was difficult with a limited number of embryos, he said. "This way we can maximise the number of researchers but minimise the number of embryos used for this purpose," he said. He explained that the cells were primitive and scientists were still a "long way" from turning them into, say, cells to be used in combating Parkinson's disease. Dr Stephen Minger, one of the lead scientists on the King's project, told the BBC: "The things we're most interested in are Type 1 diabetes and Parkinson's disease. "We already know that putting cells into patients with those diseases works but there's a significant shortage of transplantable material. "So our idea is to try to change these cells specifically into cells that make dopamine or cells that make insulin," he said. Growing very large numbers of such cells might make it possible to treat more than just the handful of patients who have currently been able to receive transplants from conventional sources, Dr Minger said. There are only around a dozen lines of cells cultivated from human embryos available to researchers in the world and the creation of a UK source for the cells will make access in Europe much easier. Stem cells were first grown from human embryos over four years ago. The King's line will be deposited in a European stem cell bank based in Hertfordshire, England. The team at King's was one of the first two to gain a licence from the UK regulatory body in this area - the Human Fertilisation and Embryology Authority - to carry out such work after the House of Lords recommended approving human embryonic stem cell research in 2002. They will now go on to try to develop procedures to guide and control the growth of stem cells so that they reliably generate useful types of cell. A spokeswoman for the Pro-Life Alliance party, a European grouping opposed to abortion, told the BBC that the extraction of stem cells from human embryos was unethical. And Dr Helen Watt, of the Linacre Centre which advises the Catholic Church on bio-ethics, said the research violated the human rights and interests of the embryos. She said the embryos were only discarded because they were "chosen to be". "This [research] is compounding the injustice of what we do to these embryos by attempting to turn them into pharmaceutical products." But Sir George Radda, chief executive of the Medical Research Council, said the research was legal and used because current research on adult stem cells had not yet proved a complete success in finding ways to help human health. "It is hoped that free and easy access [to stem cells] will speed development of new treatments"